SIR Paul McCartney and his wife were centimetres away from disaster when the pilot of their helicopter became "disorientated" in bad weather and plunged towards trees. They avoided a potentially fatal crash with just a split second to spare when the pilot dramatically lifted the chartered Sikorsky S-76C away from the rain-lashed tree tops. The drama happened as the aircraft, with the couple on board, attempted to land at night on a helipad at their estate in east Sussex, England. The helicopter eventually touched down safely after diverting to a nearby airport. 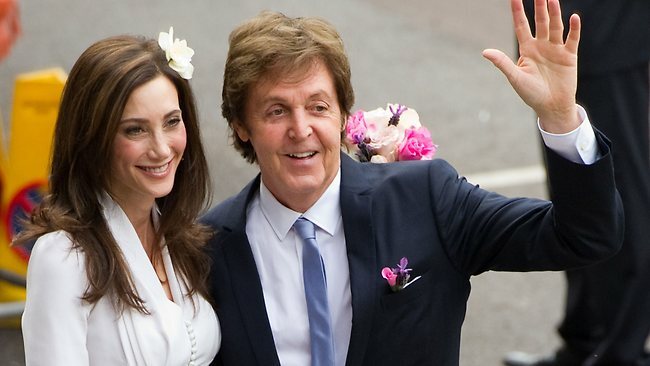 It is understood that Sir Paul, 70, and his 52-year-old wife, Nancy Shevell ? who have declined to comment about the incident ? were unaware how close they came to crashing. The near miss is being investigated by the Department of Transport. The Mail on Sunday reports that the Air Accidents Investigation Branch has categorised the episode as a "serious incident", which it defines as "involving circumstances indicating that an accident nearly occurred". According to the AAIB report, the minimum reading from the helicopter?s altimeter ? which measures height by focusing on a fixed point ? was ?two feet?. It is understood the fixed point was the tree tops rather than the ground. In pulling hard away, the 55-year-old pilot was forced to put immense pressure on the engine, which can itself be dangerous. The report also reveals flying conditions that night included "low cloudbase, poor visibility and rain". Despite this, the pilot pressed ahead and prepared to land on the former Beatle?s helipad, which is in the corner of a field encircled by woodland. It adds: "While manoeuvring, the commander became disorientated and the helicopter descended towards tops of trees in the forested area to the south and west of the landing site." The pilot then "executed a go-around" or aborted landing. The nine-seater helicopter was chartered from Air Harrods, which describes itself as the "leading London-based business aviation service provider". The firm counts Tony Blair among its clients and charges around $A5000 an hour. Earlier in the evening, the couple had been to the Liberty department store in the West End for the launch of a vegetarian cookbook written by Sir Paul?s eldest daughter Mary. Following the aborted landing, the pilot eventually landed safely after diverting to Lydd Airport in Kent, 15 miles from their home near Rye. The report also reveals that weeks after the May 3 incident, the flight data was examined using incorrect software. This meant Air Harrods was unaware the helicopter had exceeded its limitations and a ?maintenance? inspection was required. It prompted the AAIB ? which makes no judgment on blame in accidents and serious incidents ? to issue a safety recommendation about the software. The report does not mention the helicopter?s speed at the time of the incident, although some experts suggested it may have been about 60mph. The Sikorsky?s maximum cruising speed is 178mph. Peter Norton, chief executive of the British Helicopter Association, described the incident as ?alarming?. He said: "He [the pilot] was going to land and realised he wasn?t in control of the aircraft because of the weather conditions and visibility; he pulled in lots of power to climb away and correct the aircraft to its proper flightpath and missed whatever it was by two feet." Sir Paul?s spokesman said: "Paul has been spoken to. It has been put to him, everything. It?s a no comment."